DONETSK, November 5. /TASS/. Ukraineâs Armed Forces have violated the ceasefire regime 141 times, firing more than 1,200 shells at the territory of the self-proclaimed Donetsk Peopleâs Republic (DPR) in the past week, Ruslan Yakubov, the head of the DPR mission to the Joint Control and Coordination Center (JCCC), said. "Between October 29 and November 4, as many as 141 violations by the Ukrainian Armed Fo rces have been documented," Yakubov was quoted by Donetsk News Agency as saying. 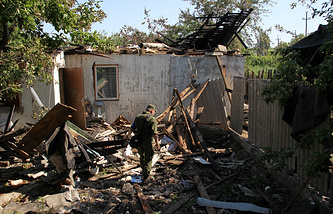 The Ukrainian military fired more than 1,200 munitions totaling 1.66 tonnes, according to the agency. In shellings, eleven infrastructure facilities and residential buildings were damaged. After a regular Minsk meeting of the Contact Group seeking peace in eastern Ukraine, another ceasefire named the âback-to-school ceasefireâ came into force at midnight on August 29. Nevertheless, the self-proclaimed Donetsk Peopleâs Republic (DPR) reported that the Ukrainian military breached the agreement by shelling the outskirts of Gorlovka three hours after the ceasefire had become effective. Since the outbreak of hostilities in Donbass, the sides have reached more than 20 ceasefire agreements.